Valeant Pharmaceuticals International comes off oddly defensive in its latest advance on Allergan. A sweetened $49 billion bid for the Botox maker disappointed investors in both companies. The use of a messy financial instrument probably didn’t help, especially after the target pushed back hard on the deal math and compared its suitor to Tyco. 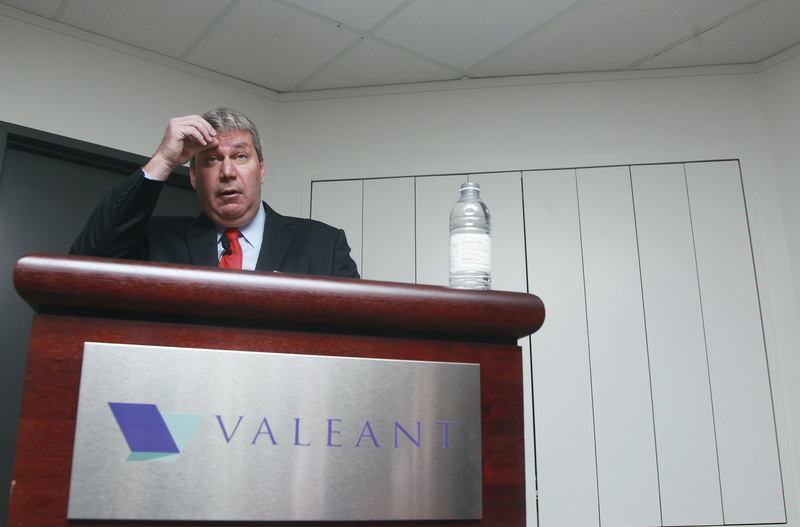 Valeant has more work to do to reclaim the role of aggressor. The Canadian company channeled Sun Tzu last month, enlisting hedge fund boss Bill Ackman to help spring its unsolicited offer on Allergan. With an estimated premium of about 23 percent, $2.7 billion of projected annual savings from the deal and the impressive track record of its own stock during years of using an acquisitive strategy, Valeant immediately put its quarry on the back foot. It didn’t take long to realize Valeant was keeping a big portion of the synergies for itself, leaving it scope to offer more. Allergan also started punching back. The California-based company on Tuesday questioned Valeant’s accounting, the stability of its management team and the viability of achieving certain R&D savings and tax cuts. In a particularly bold counterattack, Allergan raised the specter of Tyco, the conglomerate whose rollup strategy came undone amid scandal over a decade ago. Valeant’s enhanced offer seems tame by comparison. The stocks of both companies tumbled 3 percent. At about $166 a share, the bid is at least 8 percent short of what a recent JPMorgan survey found Allergan investors want. Valeant did throw in contingent value rights based on potential sales of an eye drug, but such contracts are often tricky to structure and value. It also suggests that Valeant, which would be indebted at more than eight times EBITDA after buying Allergan, may be running out of firepower. Its 176-page retort included “personal reflections” from managers attempting to present Valeant as something more than just a ruthless M&A machine. It also redoubled efforts to illustrate its cost-cutting capabilities and explain its growth, while invoking other acquirers like Novartis in a rebuttal of the Tyco dig. It all sounds like a company trying to combat the possibility that its business model of needing ever-larger deals is perceived to be on shaky ground. Valeant probably needs to reshape its message and its bid yet again to come out on top. Valeant Pharmaceuticals International on May 28 sweetened its unsolicited bid for Allergan to $49.4 billion, adding cash and a contingent value right. The Canadian company offered to pay $58.30 a share in cash, $10 more than before, and 0.83 of a Valeant share for each Allergan share. It also added a CVR related to the sales of eye drug Darpin it says could be worth $7.6 billion. Shares of Allergan and Valeant both declined by about 3 percent in morning trading following disclosure of the revised offer. An earlier version of this item misstated the location of Allergan’s headquarters in the third paragraph.